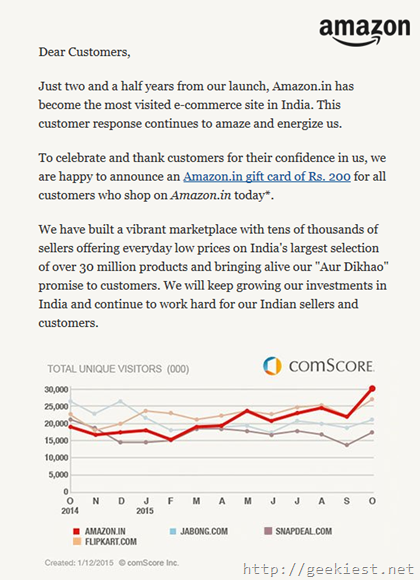 Amazon is the most visited ecommerce website in India based on the comScore. To celebrate this Amazon India is giving Amazon India Giftcards for Free when you order products from Amazon. The total order amount should be INR 500 or above to get this offer. Amazon displayed it on the home page it self. Here is how it works, just order products worth INR 500 or above, Amazon will add a gift card worth INR 200 on or before January 20, 2016. Remember this offer will be available for orders placed on 14th December 2015 only (12:00 A.M., December 14, 2015 to 11:59 P.M., December 14, 2015). Each customer is eligible to receive only one Gift Card of value Rs.200 irrespective of the number of orders placed. Cash on delivery (COD) orders are eligible for this offer. To celebrate and thank customers for their confidence in us, we are happy to announce an Amazon.in gift card of Rs. 200 for all customers who shop on Amazon.in today. You can find the details on the Amazon.in Homepage.